Raw Food Diet — Easier than You Think! As you may know, mom has fed us a raw food diet for several years now. We posted the diet and how to make it a few weeks ago. Since then, mom has been asked by several people if she has a recipe for a smaller amount that doesn’t use a grinder, so last week she made a small batch so she could show you how to do it. The process is really very much the same. Measure out your supplements and dissolve them in the warm water called for in the recipe while you process the meat and skin. 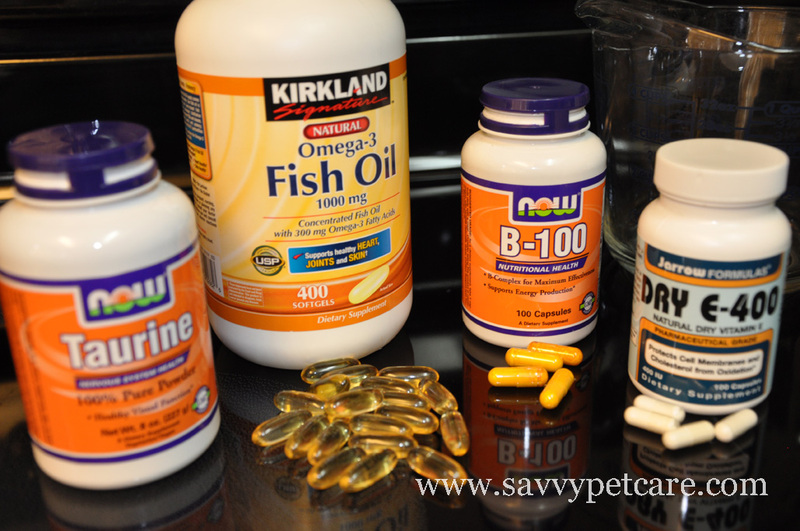 You may have seen recipes with lots more supplements but these are all that we really need. This diet comes from Dr. Lisa A. Pierson at CatInfo.org. It is what we have been eating from the beginning and we still love it. Mom started out with just under five and a half pounds of chicken thighs. She removed about half of the skin. If your kitties are thin, you can leave more skin. If they are easy keepers, like us, you can remove more skin. In the end, you want to have 3 pounds of meat and skin. Cut the meat from the bones. Mom doesn’t work too hard to get all the meat off. That makes it more time consuming but that is up to you. She just makes one cut down each side of the bone. Grind the meat and skin in batches in your food processor. It’s okay if there are some bigger chunks. We like to chew on those. Sometimes, the skin doesn’t grind up very well. It is better to cut those up by hand a little if that happens. 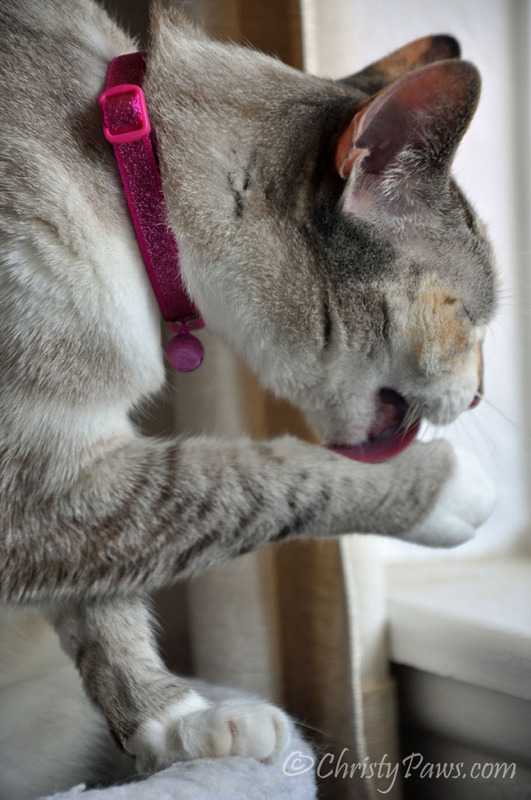 Some kitties don’t like chewing on the raw skin so much. Once your meat is ground, thoroughly stir in the supplements and divide into containers for freezing. A raw food diet really is just that simple. It took mom about half an hour to make three pounds of food. The average kitty needs 5-6 ounces of food a day so this will feed one kitty for about 8-9 days. Now remember, we started out with more than five pounds of chicken, so not using a grinder means there is some waste. But wait. Don’t just throw those bones away with all that meat on it. Mom puts them in water and makes stock. She doesn’t add any onions or veggies while the chicken is cooking. Then she takes the cooked meat off the bones and gives that to us too, mixed in with the raw or as treats. 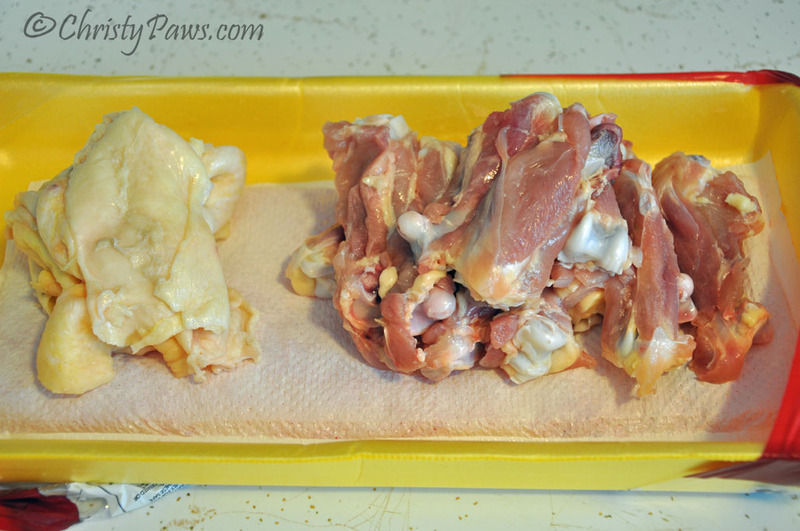 Make chicken skin treats from the leftover skin and all that goes to waste is the very clean bones! Click here for the printable 3-pound recipe. When mom feeds us, she heats our food. She puts enough for all three of us in one container and adds extra water. She says it is about the consistency of thick chili. Then she heats it in the microwave on a very low setting (power level 3) for a short time (1 minute). If this isn’t quite enough, she does the same thing again for 30 seconds. Once it is heated, she puts it in our individual bowls. If you are heating food for just one, you would need much less time. If you do heat it too much and cook it a little, it is not a tragedy. Just make sure it is cooled off before you feed it! You’ll soon get the hang of how long to heat it. Why does mom heat our food? We like our food at mouse body temperature. Do you think your kitty doesn’t like canned food the second day? It is probably because it is cold from the refrigerator. We don’t like cold food. Remember to introduce this diet to your kitties slowly. You know we don’t like change! Some of us can be very stubborn. It took mom weeks to completely transition Echo. He can still be a little finicky if he thinks it is just not quite right. 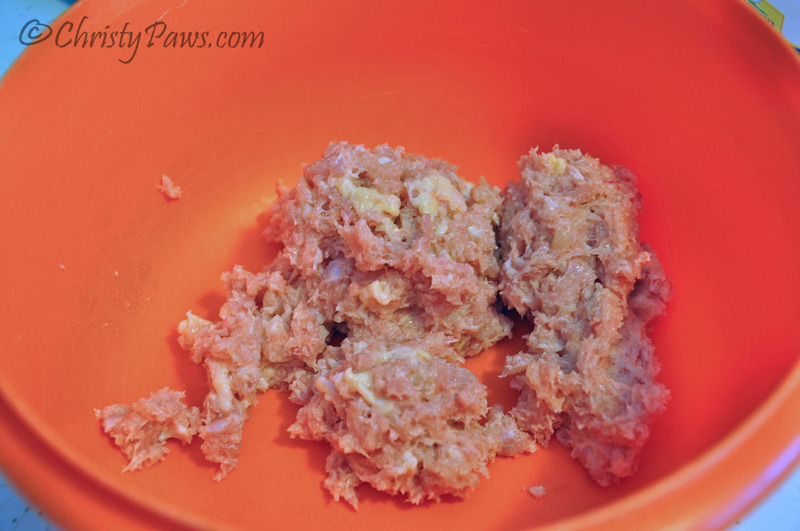 At those times, mom crumbles some of our chicken skin treats on top like croutons and that usually does the trick. 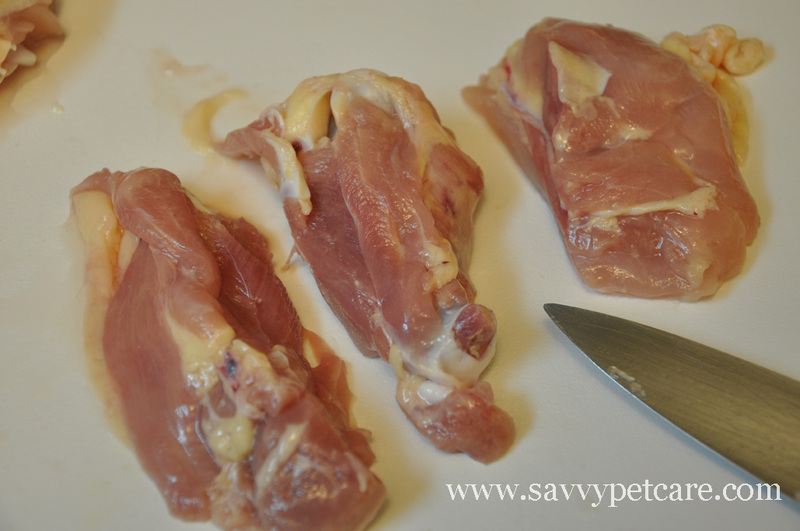 Raw chicken doesn’t have a lot of odor so sometimes it doesn’t smell like something to eat! Wishing you a healthy life with lots of good noms! Tagged cat, cat treats, chicken skin treats, Christy, raw food. Bookmark the permalink. 33 Responses to Raw Food Diet — Easier than You Think! we use dr lisa’s recipe too.. although we found that adding a bit of something green (parsley or broccoli or green beans) kept our kitties from developing pica. I’m actually getting the really big grinder for my birthday next week because we make food for 7 cats and the faster we can get through it the better. Generally it takes us an hour and a half once a month.. which isn’t much time at all when you think about it. Mom normally makes about 12 pounds at a time now for the three of us. She’s had a grinder from the beginning (she used to make about 35 pounds at a time!) but wanted to show people how easy it can be even if you don’t have one. You are going to love your big grinder, mom says. We’re raw feeders too and I was definitely surprised when it turned out to be way easier than I thought. It’s no harder than preparing my own meals and the clean up isn’t anymore difficult either. Plus, the dogs LOVE it. I know a lot of folks have success on raw – we feed semi raw time to time. Great post! How sweet, from the kitties’ point of view! I’ve considered raw food for my chihuahua, as she’s so small that it doesn’t cost much to feed her regardless, but I’m concerned about the extra germs that could end up around the kitchen and house. Do you have to be careful not to let the raw food contaminate your home? Mom has never been one to worry too much about germs. Maybe a reason she has such a strong immune system. I think as long as you wash your hands and all the dishes and clean up any spills, there should be minimal risk. Wow! That is easy to do. My mom is moving soon and I am adopting her senior cat so I am trying to figure out what kind of food is idea for cats. I’m getting pretty interested in feeding raw fro my dogs. They currently are eating a freeze dried version. Freeze dried and frozen are good alternatives if you don’t have time. Raw for dogs I think is even easier than for cats. Wow you’re good! When I do raw diet with my animals, I tend to go with the pre-made diets available at my local pet stores. Thanks for telling us how to makes it! It never occurred to me to consider a raw food diet because it seemed daunting. This makes it doable, especially with the photos to go along with it. You’re right – this isn’t so complicated and Mom says she may give it a whirl with me…..I’ve never liked chick-hen but then again “never say never” !! 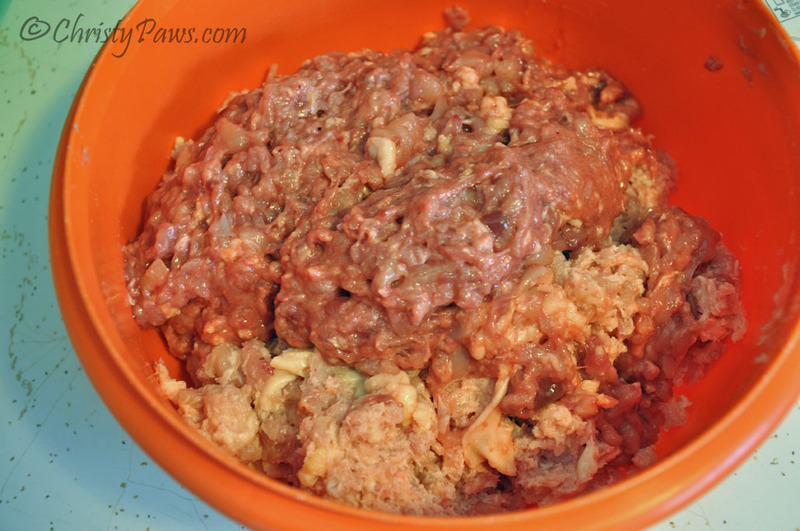 I wish my cats would eat this food but I have tried this and they loved it the first time and then the next time….not so much and the 3rd. time, they shook their front paws and walked away. DaNG! Did you try transitioning them over gradually? It took a couple of weeks for me and Ocean, and a couple of months for Echo to be eating totally raw! He really tried mom’s patience. 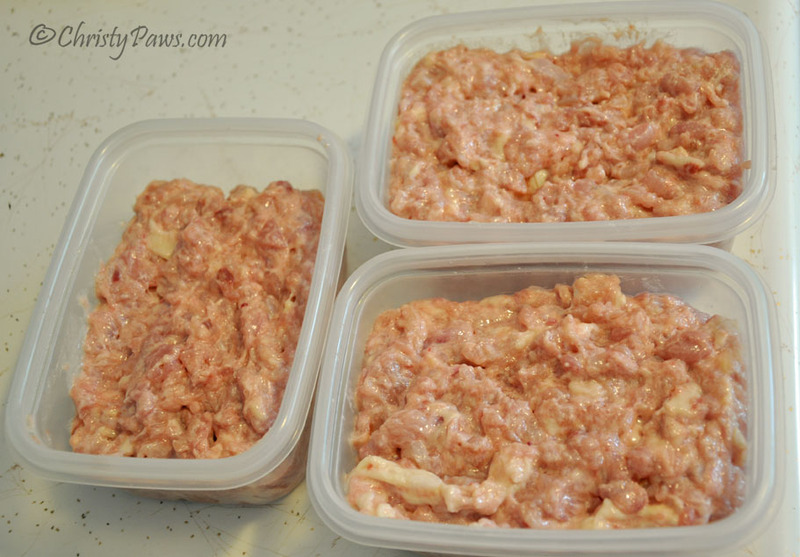 This post makes raw feeding seem much more attainable for people who don’t have a grinder. Thanks for sharing! That looks SO yummy! I will have to have my human make some! Thank you for this post. I printed out the other post a while ago and have been wanting to make it, but was too lazy. I may be able to handle this. Excellent post! Thanks! I’m glad so many are considering it. Wow! This is making Mommy think about our diet. It doesn’t sound that hard. We’re sure she could do it. I’m sure she could too! I’ll be posting more about the supplements later this week. Humans need a good kick in the pants once in a while! This is pawsum Christy. Did yous mommy get our email ’bout da supplements? Weez twyin’ to figger out how she kuld do this and afford it while at da same time still affordin’ our udder food so we can twansition. Mommy knows Lexi will do fine (or at least she used to wulda), it’s me dat she finks is gunna be a bear ’bout da change. MOL Fanks again. Have a pawsum day. I replied to your email just a few minutes ago. Wow, very interesting. The mom says she may actually try to do this for us. Thanks!! You are so very welcome. I am always happy to see kitties get started on a raw food diet.